The NWTRCC held its national gathering last weekend in Los Angeles. 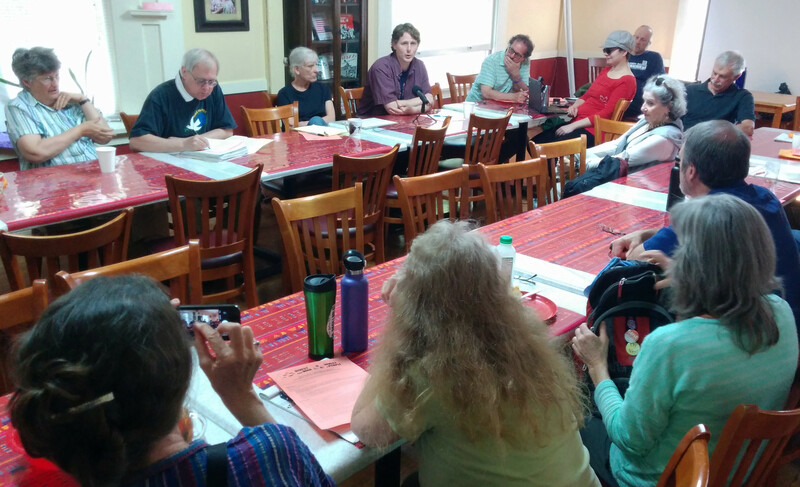 A few dozen people, including veteran war tax resisters from around the country and curious local activists, gathered at Casa Roja for a series of panels and workshops, followed by the NWTRCC business meeting on Sunday morning . We demand investments in the education, health, and safety of Black people, instead of investments in the criminalizing, caging, and harming of Black people. We want investments in Black communities, determined by Black communities, and divestment from exploitative forces including prisons, fossil fuels, police, surveillance, and exploitative corporations. Jim Haber of Jewish Voice for Peace discussed the oft-misunderstood (and persecuted) Boycott, Divestment, Sanctions movement which is trying to put economic pressure on Israel to stop oppressing Palestinians. Anne Barron spoke about how to be tactically smart in choosing divestment targets, and how the divestment tactic has spread to diverse movements including those against private prisons and fossil fuels. Paula Kahn of CodePink was scheduled to speak on the Divest from the War Machine project, but the attempt to keep a teleconference connected remotely from Tijuana (where she’s working in support of the migrant caravan) was unsuccessful, so we missed most of her message. On Saturday morning Lincoln Rice introduced himself. He’s taking over the job of NWTRCC coordinator after Ruth Benn’s 15-years at the helm. Lincoln is a long-time war tax resister who works with the Casa Maria Catholic Worker house in Milwaukee. We also spent some time Saturday morning discussing the current state of activism and organizing in our communities. This was a good opportunity to learn about trends and innovations around the country from people who have been working in a variety of causes, ranging from responsible investing, to counterrecruitment in the schools, to environmental activism and climate change concerns, to youth-led challenges to structural violence, to assistance for immigrants, to organized tax redirection, to grassroots media. 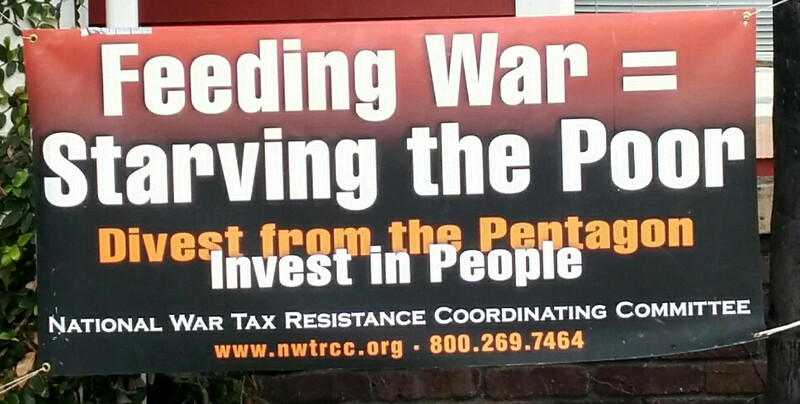 Experienced resisters held a “War Tax Resistance 102” session after lunch. I asked around to see if anyone had yet been targeted by the new federal government policies that can deny passports to people with large tax debts, or that can turn federal tax debts over to private debt collection companies. So far nobody has heard of any war tax resisters who have had their passports denied or rescinded, but a couple of resisters have had private collection agencies assigned to their cases. After that I led a workshop on Quaker war tax resistance and that of other congregations and faith-based organizations. 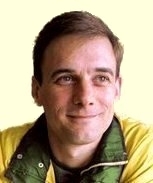 I gave a brief overview of the history and varieties of war tax resistance in the Society of Friends, and mentioned how some other groups like Brethren, Mennonites, Jehovah’s Witnesses, Catholic Workers, and more recently groups like the Agape Community, Restored Israel of Yahweh, and the new monastic movement, have incorporated war tax resistance into their practices. We then discussed how people might try to introduce or promote war tax resistance as a spiritual practice and a way of strengthening and distinguishing faith-based communities. That evening, we learned more about The Poor People’s Campaign (“A National Call for Moral Revival”), which is ramping up and looks to potentially be a strong protest focal point on the left in the U.S.
Sunday morning NWTRCC held its business meeting. I don’t have much to report: some run-of-the-mill policy and budget discussion, details surrounding the transition in the coordinator position, a couple of new administrative committee members coming on board. While I was away I got another letter from the IRS. No big surprises, just a “balance due” notice for my 2017 tax return.